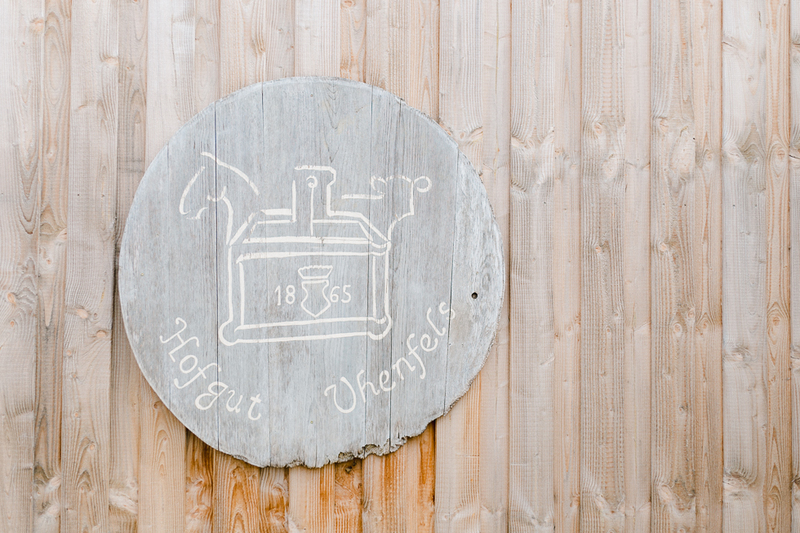 Julia and Magnus had the most perfect, outdoor wedding of dreams. As a wedding photographer, for so long I’ve been a passionate advocate for outdoor weddings and this was truly a beautiful example of how to have a fun, laid-back celebration in the open air. Everything about this wedding was charming and effortless, a relaxed atmosphere with the simple beauty of nature inspiring every creative detail. 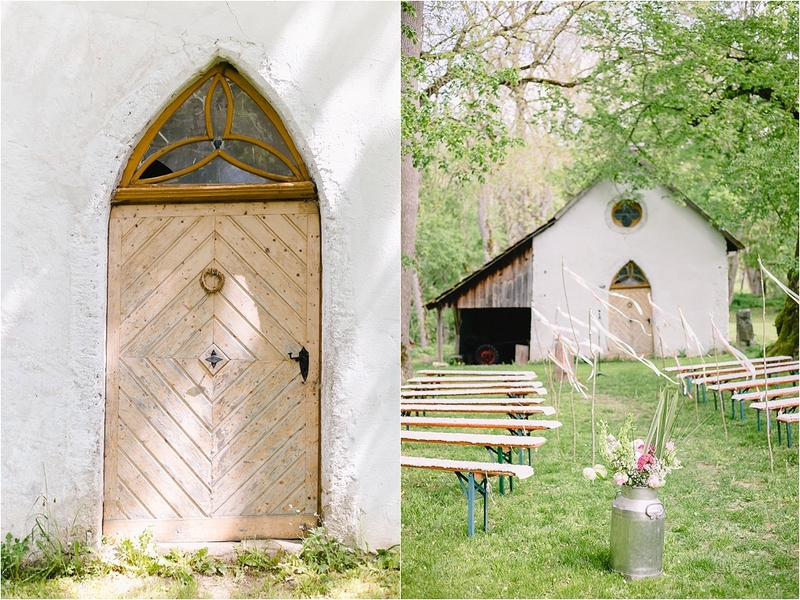 The rural location of Hofgut Uhenfels provided a natural backdrop for the couple to get married beneath the trees next to an old restored chapel. Guests gathered on wooden benches for the outdoor ceremony. Coloured ribbons tied to long sticks lined the aisle and fluttered in the breeze. Julia’s beloved horse Ferdinand played a starring role, strewn with flower garlands, he carried the bride to the ceremony. I adored horses as a girl and like Julia, have been riding since my youth so this was an incredibly special highlight of the day. Ferdinand even had his own getting-ready, and the bride and groom also left the ceremony on horseback. Then later on, the horses featured again as part of the sunset portrait shoot of the newlyweds. Happy people make for happy photos and Julia’s close group of girlfriends were an endless source of laughter and fun. The girls had stayed together the night before the wedding and were there to support and cheer on the bride during her big day. After the marriage, family and friends gathered in the courtyard for pulled pork burgers straight from the grill. As the night grew cooler, the party moved inside to part of the restored barn where long tables were laid for dinner. Decorations again were full of rustic details and natural textures. Wild flowers had been gathered and arranged loosely into the bride’s collection of vintage jugs and vases. These, as well as potted cacti were placed along the tabletops where white candles flickered in simple glass jars. Bright pom poms hung from the wooden beams and the bride herself had illustrated the sweet flower themed invitations, menus and place settings. This was truly a wedding full of natural pretty details; even the cakes were sprinkled with wild berries and flower petals. What a wonderful outdoor country setting to mark the beginning of married life together. Cake – Kaffeehaus & Restaurant Rosenkranz, Pfullingen. Did you know I love outdoor weddings so much that I’ve written a guide about them, to help make the planning for every outdoor wedding bride easier? Check it out here (in German). If you would like us to capture your wedding, we would be delighted to hear from you. 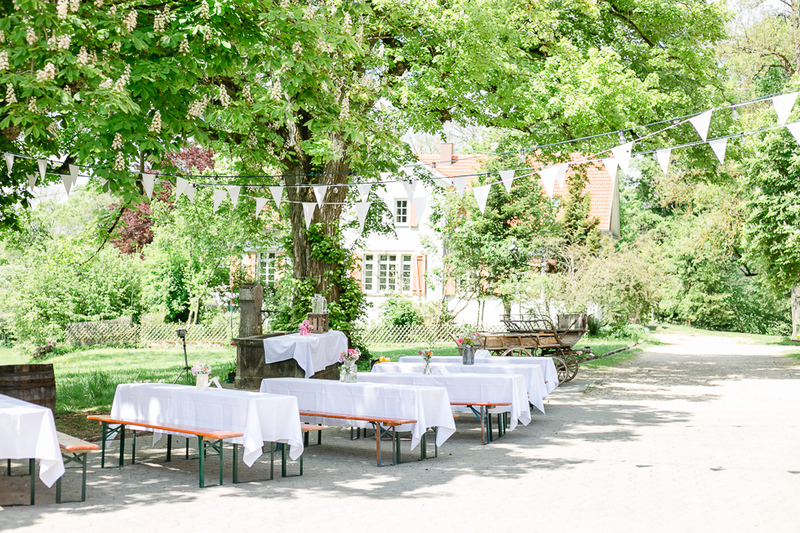 Check out my outdoor wedding guide here (in German).